Southeast corner of the Science Center. 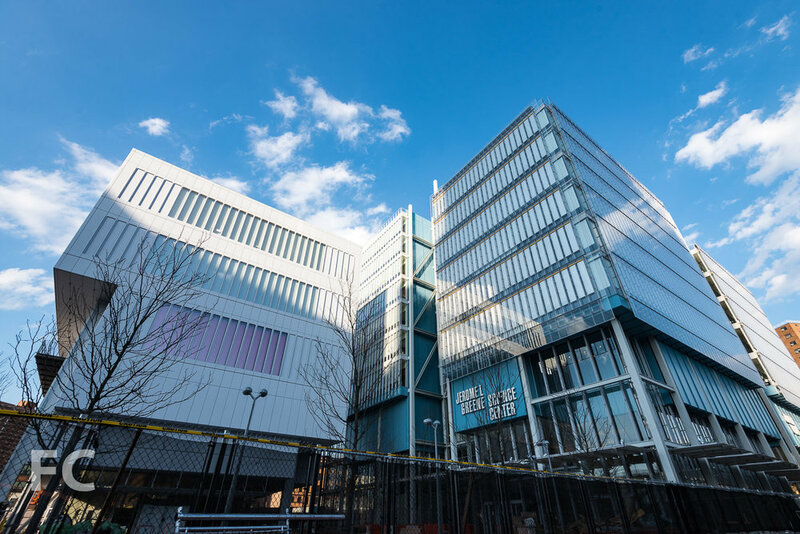 Two of the phase one buildings at Columbia University's Manhattanville campus have completed construction and are now open. Renzo Piano's firm has overseen the design of both the Jerome L. Greene Science Center and the Lenfest Center for the Arts. The 9-story, 450,000 square-foot science center will bring together researchers from across the University including the Columbia University Medical Center, the Faculty of Arts and Sciences, and the Fu Foundation School of Engineering and Applied Science. The ground floor will house the Center for Education and Outreach, a public education center focused on brain science that will serve the general public and K-12 schools. Looking west towards the Academic Conference Center (left) and the Science Center (right). Looking up at the south façade of the Science Center. Ground floor façade of the Science Center. The newly completed Lenfest Center for the Arts, also designed by the Renzo Piano Building Workshop (RPBW), sits to the west of the Science Center and houses galleries, performance spaces, a screening room, and offices in an eight-story structure. A unitized panel system of white metal and glass clads the exterior, a similar look to the firm's Whitney Museum at the High Line. Looking up at the Center for the Arts (left) and the Science Center (right). Looking east towards the Center for the Arts (left), the Science Center (center), and the Academic Conference Center (right). Steel superstructure has topped out at the third RPBW building in Columbia University's master plan for the Manhattanville campus, the Academic Conference Center. Located south of the Science Center, it will house a 400-seat auditorium and state-of-the-art seminar and meeting rooms inside a five-story structure. Southeast corner of the Academic Conference Center. South façade of the Academic Conference Center. Steel superstructure of the Academic Conference Center. Looking east towards the Manhattanville Expansion campus. Preliminary excavation work is underway at the site of the future Business School, a two building design from Diller Scofidio + Renfro with FXFOWLE. Construction site of the future Business School. Architects: Renzo Piano Building Workshop with Davis Brody Bond LLP (Science Center and Center for the Arts), RPBW with Dattner Architects (Academic Conference Center); Program: Education; Location: Manhattanville, New York, NY; Completion: 2017 (Science Center and Center for the Arts), 2018 (Academic Conference Center).